Tucked away down the garden path at the back of CBeebies Land, tiddlers can discover Mr Bloom's Allotment, where all their favourite fruit and veg come to life in a show like no other. When you join the queue for this gardening treat, you'll soon find yourself weaving between the plant beds laid out with care by Mr Bloom. As you wait why not see how many of your favourite plants you can spot growing in this quiet corner of the park. Soon enough however it will be time for you to head inside the shed, where the Veggies are waiting, but before you do Mr Bloom has left a video message for all of his friends. Whilst Mr Bloom is on holidays he's left his allotment in the safe hands of his neighbours The Blossoms, but there's always so much work to do down on the allotment, they're sure to be thankful from a helping hand from the Tiddlers. As you enter the shed, you discover that it's bedtime on the Allotment, but the Veggies are far too excited to sleep, especially since the Tiddlers have come to see them down the garden path. But bedtime is important for growing veggies, so perhaps you can help him sing the plants to sleep? And don't forget, Compo needs feeding too! 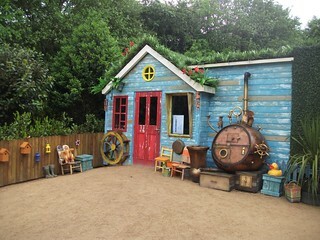 Mr Bloom's Allotment is a brand new attraction that was built as part of the of CBeebies Land development in 2014. The area it's located in has never previously been home to any fixed attractions, but was once one of the animal Paddocks of Old MacDonald's Farmyard. In more recent years this paddock was home to the chickens that featured as part of the Furry Friends.